We knew that the health and fitness tech announcements from CES 2013 this year would be interesting and even though the show hasn’t officially kicked off for the public yet, health and fitness tech specialist Withings has revealed it’ll be launching a Smart Activity Tracker to add to its ecosystem of life tracking gadgets, apps and services. The compact little gadget looks as if it’s set to directly compete with the likes of the Fitbit One, Nike+ Fuelband and Basis offerings, as it’s packing tech to track a number of performance-based metrics, like a sleep monitor and pedometer, as well as being able to read your pulse too – a feature a lot of the other gadgets on the market aren’t capable of doing quite yet. The device is tiny at 8.3mm thick and a length of 43.3mm, which means you’ll be able to attach it to a belt loop or throw it into your pocket. 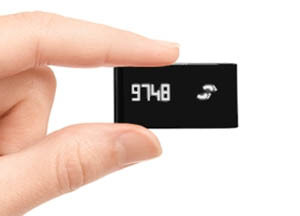 It’s also rechargeable via a micro-USB port and can be connected via bluetooth straight to your phone, enabling users to power up the dedicated Withings app and get a more detailed look at their daily stats. We don’t have any official news about when the tracker will be available, but you can sign up for email updates depending on which country you live in over on the Withings website. One Response to "CES 2013: Withings announces smart activity tracker"